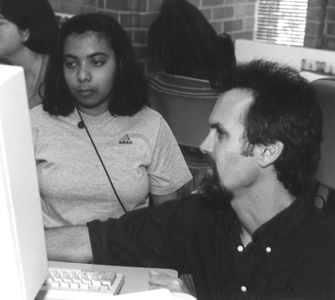 Doug Hayman shares technology tips with Rima, Phase I Scholar. The Internet has opened up a whole new world to people of all ages and abilities. Real-time communication with friends in all parts of the world is now commonplace and easily carried out with e-mail, chat, and other Web-based tools. Where children a few years ago would tie up the family telephone chatting with their friends, they're now online for hours chatting real-time with messenger tools and in chat rooms. Likewise, research that used to be carried out with the family's encyclopedia books has been replaced with the vast depository of information available on the World Wide Web. The Internet is a human creation made up of folks from all walks of life. Some of those people you wouldn't want to leave alone with children. And yet many children are out there playing in a virtual playground, unaware of the real-world dangers that exist. There is a now famous cartoon, of a dog at a computer keyboard with the caption, "On the Internet, nobody knows that you're a dog." Likewise, on the Internet, no one knows your age, gender, address, phone number, or other personal information unless you reveal that directly or indirectly. While it could be fun to take on the persona of someone you are not and pretend with someone else via e-mail or chat, it can have grave consequences. This is especially true if a virtual dialogue is followed by an in-person meeting. On Friday, May 17, 2002, while DO-IT Scholars were enjoying another Pizza Party in Seattle and Spokane, across the country 13-year-old Christina Long went to meet a 25-year-old man at a nearby mall in Danbury, Connecticut. They had met online and in person several times. Her body was found the following Monday. She'd been strangled by this man. It turns out that she'd been living a double life, one known by fellow students as a happy, successful classmate. The other included venturing into places children should not go. While Christina went looking for dangerous adventures, others unwittingly invite it by passively revealing information that should remain private. No one needs to know your real name, age, gender, address, phone number, social security number, whether or not your parents are home, and other details of your life that could be used by online predators. Don't give out personal information (name, age, address, phone number, social security number) to strangers. Never meet in person with an online stranger unless you get your parent's permission and have them come with you. Never invite a stranger to come meet you in person or call you at your home. Don't open attachments from strangers (or friends) without scanning them with an up-to-date anti-virus program. Tell your parents right away if online interaction makes you feel uncomfortable or scared. Use an online name that doesn't reveal your gender or age. A bad choice would be Mary_12; better names are "oaktree99", "grasshopper", and other gender and age neutral monikers. Use passwords that meet the highest standards of privacy. Avoid using common words, pet names, or common word combinations. Instead, use combinations of upper and lowercase letters/characters along with numbers. And, don't give your password out to anyone. Set up a separate e-mail account for times that you must provide an e-mail address to then be able to trap unwanted "spam". Several free services like www.hotmail.com or www.yahoo.com are ideal for this. Be sure to set the options for maximum privacy when creating such an account. Use a firewall program, which restricts the flow into and out of a computer connected to a network. This will minimize the threat of intrusion, especially if you have a cable or DSL account that is always connected to the Internet. Maintain operating system updates to close vulnerabilities as they become known. Following these guidelines will not guarantee safety on the Internet, but they may help safeguard you and your family.